History | Aeronautical Radio of Thailand LTD.
After the First World War, The Post and Telegraph Department was appointed by the Royal Thai Government to provide air traffic control and aeronautical communication services. As the Second World War broke out in Asia, civil and commercial aviation was forced to cease operations. After the end of the Second World War, commercial and civil aviation operations resumed. In 1948, Aeronautical Radio Inc. (ARINC) of the United States of America, International Aeradio Ltd. (IAL) of the United Kingdom and various airlines operators together formed the Aeronautical Radio of Siam Ltd. (AEROSIAM). AEROSIAM provided air traffic control and aeronautical communication services under contract with the Royal Thai Government in compliance with the standards and recommendations of the International Civil Aviation Organization (ICAO). 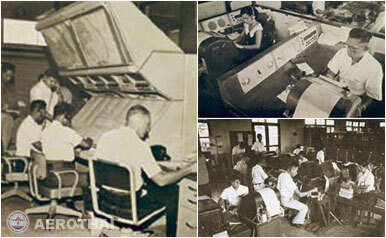 Recognizing the importance of AEROSIAM's operations to national security and the development of the aviation industry, the Royal Thai Government acquired the entire share capital of the company on November 6, 1963 and changed its name to Aeronautical Radio of Thailand Ltd. (AEROTHAI). Later, the airlines that operated in and out of the Kingdom were allowed to become minor shareholders. At present, AEROTHAI is a state enterprise under the Ministry of Transport and Communications. Under the contract with the government, AEROTHAI is to operate on a cost-recovery basis in providing air traffic control and aeronautical telecommunication services within Bangkok Flight Information Region and is a part of the network of organizations that provide similar services globally. In 1975, during the Vietnam War, AEROTHAI was assigned by ICAO to provide services for airspace over part of the South China Sea belonging to Vietnam: part of this responsibility was handed back to Vietnam in 1994. Furthermore, the responsibility for the airspace over Cambodia at an altitude above 19,500 feet was also assigned to AEROTHAI in 1993. Later, the Government put forward a policy to develop the domestic air transport industry, following the National Economic and Social Development Plan that aimed to position Thailand as the hub of air transportation in South East Asia. This includes the need to provide effective and efficient air traffic services at all airports nationwide. AEROTHAI was thus assigned additional responsibilities of providing air traffic services at all of Thailand's international airports as well as all the domestic airports previously under the supervision of the Department of Aviation as well as Bangkok Airways' Samui and Sukhothai Airports. Assigning responsibility for all air traffic services to one organization has resulted in uniformity in service standards and increased cost effectiveness. 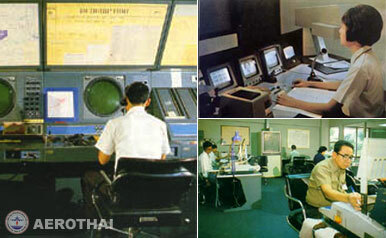 It has also been a driving force in the development of the air transport industry in Thailand.